We thought it would be nice if you got to know our family a bit more before the fall sales. Many of you know me. I’ve been an owner of Divine Consign since we began in 2001. I can’t believe it’s been 16 years! I had no idea what I was getting into but I’m so glad I went along for the ride. When I’m not working on the sale I love teaching my class of 3rd graders at church and trying new restaurants with David. David serves as the Executive Minister at The Branch Church (where, incidentally, we met! ), which means he deals with the “business” side of church. He spent over 30 years working for Texas Instruments until God called him to his current position in 2015. He loves getting to use his Mechanical Engineering brain for all things data and logistics-related with the sale. He rarely stands still during sale week so you’ll find him somewhere out on the sales floor fixing something, matching up tags or whatever needs done. He’s my go-to for everything. He’s been supportive of this business from Day 1, and I’m so thankful. When he’s not at work or at the sale he’s volunteering in the youth ministry at church or out in the garage building something. Sam is a Security Analyst for AVS Technologies in Richardson. He provides technical support for physical security devices like card readers and cameras, mostly in data centers. At Divine Consign, he’s in charge of Set-up and security and is a master at loading big stuff in small cars. But he’d definitely want me to tell you to just go ahead and bring the biggest car you can! In his spare time he leads a middle school small group at church and likes to play street hockey and hang out with his new puppy. Nikki is the Durable Medical Equipment Coordinator at Texas Orthopedic Specialists in Bedford and is the head Athletic Trainer at Grapevine Faith Christian School. Her job entails injury prevention, evaluation, treatment and rehabilitation of all of the athletes at the school. At the sales, she in charge of credit card operations, condensing as we sell through items and the “office” part of Breakdown. 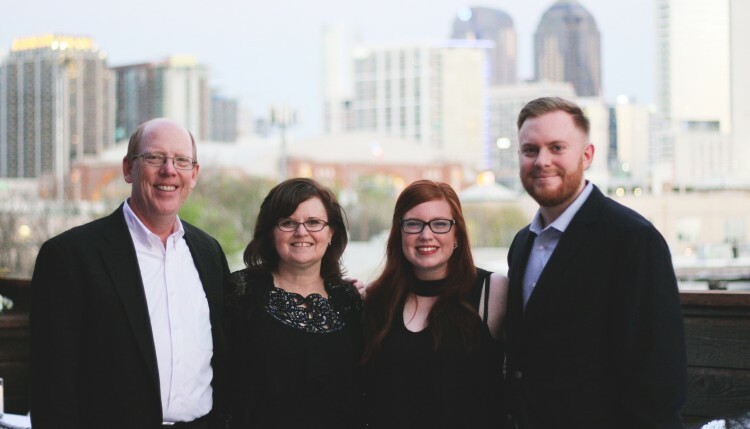 She has very little free time during the school year but she leads the Young Professionals small group at church and loves exploring DFW with her friends. Both she and Sam have been involved with the sale since they were kids and are skilled in handling practically all aspects of sale week. We’re so grateful YOU are part of the Divine Consign family.